Starting September 2014, SCALES will start a new venture with GSA lab seeking for new ways of building three dimensional free-form stone vaults. Geometrie-Structure-Architecture (GSA) is one of the three research laboratories of the Architecture School of Paris-Malaquais. Founded in 1990, it has been regularly authorized by the office of architectural, urban and landscape research (BRAUP) affiliated to the french Ministry of Culture. Prof. Maher Amro from the department of Civil Engineering of Polytechnic School of Hebron will be part of the team, as well as Muhammad Sharia, from Al-Quds University. In 2013, AAU Anastas and GSA collaborated for Stonesourcing Space, a stone pavilion which adapts traditional techniques to the imperatives of resistance within the framework of the Palestinian public space. Stonesourcing Space project comes from the questioning of the exclusive technique of stone construction in Palestine.Stone is an abundant material. It is found in easily in the landscape, it is widely available and it benefits from an advanced local know -how. Historically, palestinian cities were built around a dense nucleus in a self-managed manner. Buildings were built with thick bearing walls using the thermal inertia property of stone to regulate inside temperatures. With the arrival of the heavily administrated Ottoman Empire in Palestine, an urban authority was put in place and the use of stone turned from a natural choice to an imposed building material for all constructions. This law is today still applied even though in the meantime reinforced concrete was largely spread into the construction world: the structural skeleton is built in reinforced concrete and stone is pushed into the background as a facade cladding acting to satisfy a law that is de facto obsolete. Thus, today’s stone factories only produce standardized blocks of 2, 3 or 5 cm. The sophisticated know-how regarding the use of stone as structural and thermal performant material is progressively disappearing. Construction is limited to a single unique building technique and many embellishments. 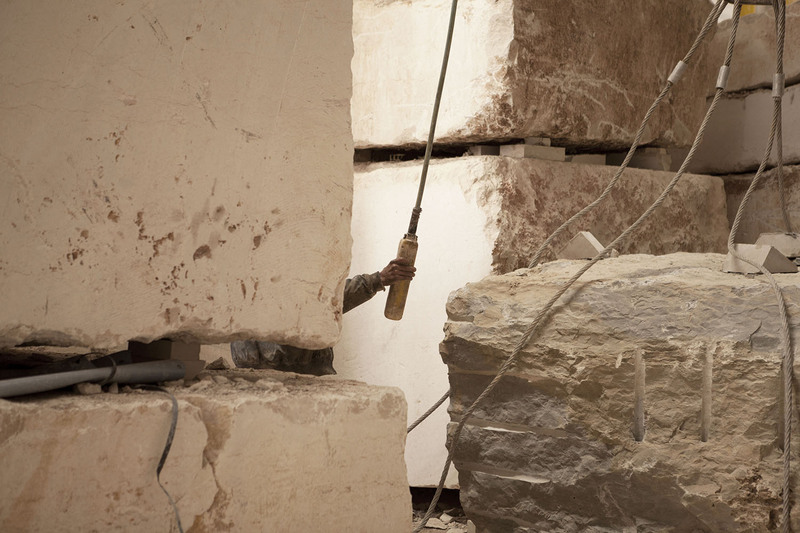 For Al-Maqdissi research project, we aim to question the unique exclusive stone construction technique by presenting stone as an economical, innovative alternative. In a wider international context, there are only few regulations on the use of stone as a structural material. We are convinced that stone is a contemporary material, which can be revived through the use of new simulation and fabrication processes. For instance, the compressive strength of most of the palestinian local stone is three to four times greater than concrete. Along with GSA lab, SCALES, and the Polytechnic School of Hebron, our team benefits from a great knowledge in the domain of computational design and advanced techniques of fabrication coupled to parametrized geometry and structural analysis. One of our main ambition is to link fabrication processes to architecture: robotic fabrication techniques are a key to the future of stone use. As a revolt against the generic and exclusive way of building in Palestine, Al-Maqdissi’s research conclusions intend to be a strategic awareness for new visions of urban morphologies.